Nuby Toothbrush Massager with Protective Case | Blue | Unique texture design provide your little one soothing and comfort little gums. 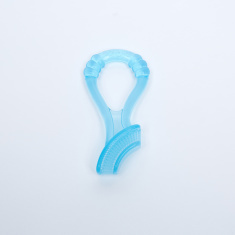 Pick this toothbrush massager for your baby which will be smooth on your child's gums. The handle makes it easy to hold for your child and comes with a case to protect it from catching germs and dust. Feature 2 : Easy to hold for your baby's little hand with super soft silicone handle.